On her (above): Channel beachy vibes with this sheer gown, complete with a tulle overskirt perfect for those island breezes. Monique Lhuillier hand-painted tulle illusion gown with tulle overskirt (price upon request at Marcella’s La Boutique and Nordstrom Wedding Suite). On him (above): Keep things playful and beach-centric with a fern-print suit and simple V-neck tee. Topman fern-print jacket ($280) and skinny trouser ($120), both Nordstrom. Black V-neck T-shirt ($18), Zara. For any bold bride who enjoys a dramatic entrance, go for this Claire Pettibone Nightingale dress with plunging neckline, French embroidered art nouveau accents at the waist, and layered lace and tulle skirt with scalloped hem (price upon request at the Dress Theory). Gold bangle bracelet ($34) and gold cuff bracelet ($34), both Katie Waltman. Wow your guests with this boho chic invitation suite, created by Paper Delights. A cream, doubled-sided invite combines bohemian elements perfect for a tropical location with cool, clean modern graphics. 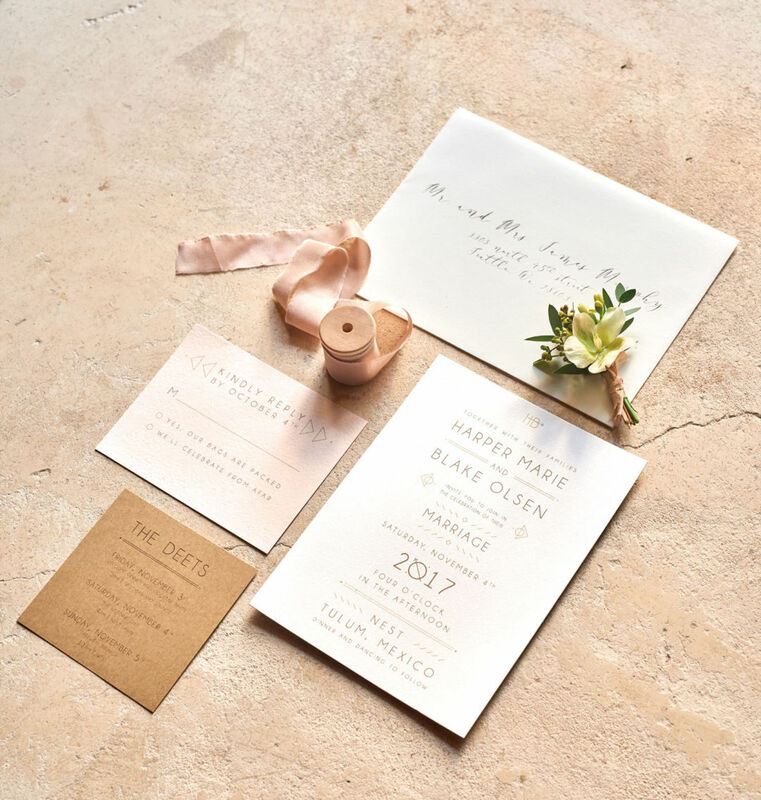 Add in pops of subtle color with a luxe blush reply card and a wood grain card with all pertinent details. Tying everything together is a custom calligraphy envelope. Full suite available for $8/invite. We love how this Rime Arodaky piece walks the line of formal and playful. Rime Arodaky crop top in crêpe and floral embroidered tulle with high-waist crêpe and embroidered tulle skirt (price upon request at the Dress Theory). Bouquet by Xochitl Botanicals. Mimic frothy ocean waves in this beaded Hayley Paige organza A-line bridal gown in Moondust, featuring a prismatic illusion bodice with bateau neckline and V-neck beaded detail, open net back, and full organza skirt with slit (price upon request at the Dress Theory and the Wedding Suite at Nordstrom). Gold hoop earrings ($58), Katie Waltman. On him: Topman rose dust jacket ($220) and ultra-skinny trousers ($80), both Topman. White V-neck T-shirt ($17), Gap. Black leather wristwatch ($135), Tommy Bahama at Bridgeport Village. Hook + Albert black lapel flower ($30), Nordstrom. Be it sunrise or sunset, you’ll shine bright in this vintage gold, sheer sequin, and beaded gown ($380 at Salt On the Rocks). Gold fringe earrings ($48), Katie Waltman. Stun your guests with this Gala by Galia Lahav bridal ensemble featuring a sheer, pleated lace inner dress and vintage hand-embroidered antique net with medallions and bows (price upon request at the Dress Theory). Large round crystal studs with silver earring jackets ($56), Katie Waltman. Capture the look of sun glittering off the waves in this flowy Claire La Faye gold-sequined A-line gown with fitted V-neck bodice and back (price upon request). Nestled along Tulum’s famed turquoise coastline and milky-white beaches, and tucked under a canopy of palm trees in a vibrant jungle paradise lies the luxury boutique hotel Nest. The intimate property showcases natural simplicity at its finest; the modern-minimalist Mexican aesthetic features sun-bleached stone dwellings, wood and woven textures, and casual, tropical vibes. Nest has nine rooms that, all together, can sleep up to 22 people, some with ocean views and terraces, and an on-site restaurant and bar serving up colorful Mexican-fusion cuisine, fresh fruit juices, and never-ending margaritas. The private, beachside setting is prime for destination weddings of up to 60 guests, as well as romantic honeymoons or unforgettable bachelor and bachelorette getaways. Visit nesttulum.com for more information.